Brian Burke has pulled the trigger on his first free agent signing of 2010. 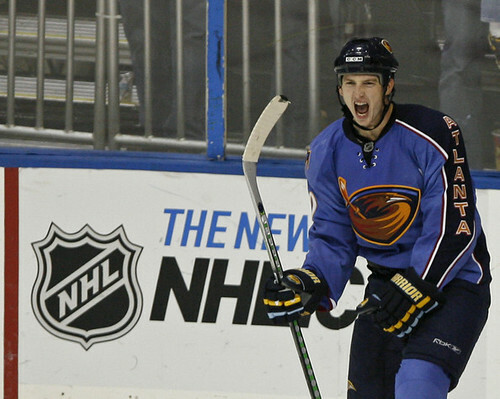 He's signed Colby Armstrong, who played with the Atlanta Thrashers last season. He'll make $3 million a year for the next three years. He's a tough 27-year old with with 78 goals, 100 assists and 317 penalty minutes in 360 career games. Burke sure likes the players that are tough to play against, but at some point he's going to have to add a skilled forward or two or we're in for another long season. I agree a good signing but TOO MUCH $$. Versteeg a great deal. There a no veterans on the team other than Kaberle who will be dealt before next year. Bring back Wendal for 1 more year or Cujo. I wanna see Doug Gilmour back. We need leadership.